I’ve been into lockpicking for a few years now, and I’m surprised I’ve never posted more about it (maybe I will). Suffice it to say that lockpicking is great fun, you learn a lot, and one day it may come in handy (legally of course). 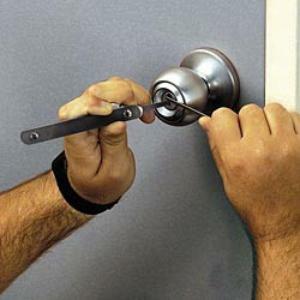 One thing I’ve noticed whenever I talk about lockpicking, is that most people -including techies – have very little clue about how locks themselves actually work. It’s no surprise then that lockpicking feels like a bit of mystery to many. 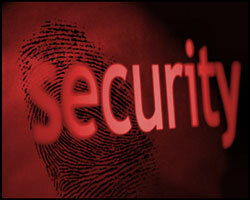 In reality the majority of locks are very simple devices, and many can be picked or bypassed using fairly simple tools. I had the pleasure of taking part in the Defcon 19 Gringo Warrior contest where participants must bypass a series of locks to ‘escape’. It’s scored based on time and difficult of locks picked. I scored about above average. In this post I’m going to give my own shotgun intro to lockpicking, and provide some videos and links to other useful references where you can go find more detail. There aren’t too many things you need to understand in order to get into basic lockpicking, but the first thing is to understand the internal components of a basic pin tumbler lock, and how a key activates them in order to open it. In short: every lock has a keyway, and one or more stacks of pins consisting of (from the bottom) a bottom pin, a top pin (aka. driver pin), and a spring. 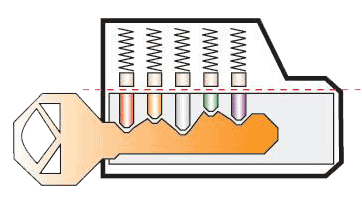 When the correct key is inserted into the keyway, the pins are raised in such a way that the top pins and bottom pins are positioned on either side of the ‘shear line’. That’s the line within the lock where the plug rotates. Once all pins are aligned correctly, the plug can turn and the lock opens. The video below depicts this concept a bit more clearly. The aim of lockpicking is to achieve the same outcome, by sequentially pushing pins in the correct order. In order to do so it’s necessary to apply torque to the lock, essentially the same a turning the key in the lock. To do so we use a torque wrench (or tensioner) – essentially a bent piece of metal – to apply a very light amount of torque. One tip here is to apply a very light touch on the torque wrench. Most beginners tend to apply force, essentially squeezing the pins and not allowing them to move. The pressure you apply should be no more than needed to start the plug turning, and it takes lots of practice to get used to. Lockpicking itself actually exploits slight manufacturing flaws in the drilling of the stack holes. By applying torque the plug will bind (get stuck) on the first pin that’s currently ‘in the way’. By gradually pushing up the correct pins using a pick, the pin will ‘set’ into its ‘open’ position, the plug will turn ever so slightly, each time binding on the next pin that’s in the way, until eventually all top pins are out of the way, and the lock can open. Single-pin picking is the process of pushing individual pins as described above. Another method of achieving the same result faster, and easier for beginners, is called raking. Raking is usually done using a rake pick, and involves sliding the pick across the top of the pins whilst applying torque. The idea behind raking is to get multiple pins to ‘set’ at once, thus expediting the process. Note that for higher quality locks, the effectiveness of raking diminishes. An example of raking is shown in the video below. With raking, my recommendation is usually to sort of ‘caress’ the top of the pins in a cyclical motion. With lockpicking in general, you should always try to have a fairly light touch. The picks should move in and out of the keyway horizontally; there shouldn’t be any twisting, turning or bending of the picks themselves (or any other motion that would cause them to come out mangled). When starting out, just practice pushing down each pin one by one, getting a feel for the feedback through the pick. Learn when a pin is binding, and the slight movement when the plug turns ever so slightly; these are the basics that experienced lockpickers do as second nature. I saw Schuyler Towne’s presentation at DC19, and he just recently released a 24-video series on introductory lockpicking, which includes a segment on how to make your own. If you’re just starting out I highly recommend watching these. Just click play below and the entire series will play through. There are countless other lockpicking videos on YouTube, so it’s worth having a look on there. I also recommend checking out the MIT Guide to Lockpicking which has a bunch of useful info on the topic. If you want a good book to learn lockpicking, then you probably can’t do much better than Deviant Ollam’s Practical Lock Picking (it’s also worth checking out his site). In order to start lockpicking, you’re going to need some picks. A basic 8-pick set is more than enough for the majority of situations. You can even start out by just getting one diamond pick, one snake pick/rake, and one tensioner. Southord produce some high quality picks, I own their 8-pick set as well as their jacknife set. If you’re interested in learning about the different types of picks, check out this DerbyCon talk by Deviant Ollam. 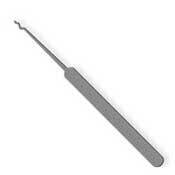 Note that the laws around owning lockpicks differ by state and country. Familiarise yourself with the laws in your area before trying to get any picks! Although I don’t recommend them for beginners, it is entirely possible to make a usable ’emergency’ lockpick and tension wrench using nothing but paperclips! Lockpicking is great fun, but takes a lot of practice to get right. The reason I kept this short is because you can read countless books and articles, and watch endless videos, but you’ll never actually progress unless you get hands-on. So get some picks, grab some padlocks and give it a try! If you ever get to go to a security conference, check out whether it has a lockpicking village, as they’re great places to try your hand at new locks and meet some experienced pickers. Remember to only pick locks you have permission to use, and don’t pick locks you rely on, as it’s possible to damage or destroy a lock if you do it wrong! Enjoy. P.S. Every so often you’ll go to pick a lock and discover an altogether bigger problem, like I did in my hotel room in Hawaii.